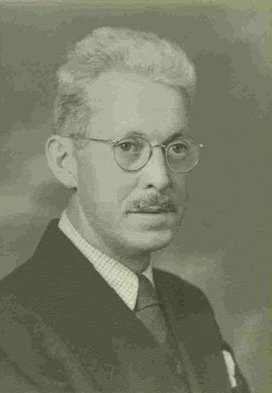 Stanley Pickett Rockwell (born 3 May 1886 in Thompsonville, Enfield, Hartford County, Connecticut; died August 1940) was a US-american metallurgist, who invented the Rockwell hardness testing machine together with Hugh M. Rockwell (1890-1957). Stanley Rockwell graduated in 1907 from the Sheffield Scientific School of Yale University successfully, where he was also active in the rowing team last year. After graduation, he worked as a metallurgist at the New Departure Bell Company in Bristol, Connecticut, which was founded in 1888 by the brothers Albert F. Rockwell (1863-1925) and Edward D. Rockwell (1854-1925) within a watch factory. His colleague Hugh Rockwell was the son of Albert Rockwell, the president of the company, but with whom he was most likely not related. Hugh and Stanley Rockwell jointly developed a hardness tester that measured the hardness of curved bearing rings and cones. They filed for a patent on July 15, 1914, which was published on February 11, 1919 with US Patent Number 1,294,171. By that time, the two Rockwells had already left the company. Stanley Rockwell later worked for Weeks & Hoffmann in Syracuse, New York. There, he improved the design of the original Rockwell hardness tester and filed in September 1919 a patent on it, which was published on 18 November 1924 with US patent number 1,516,207. When he left New Departure, he was recruited by the Whitney Manufacturing Company of Hartford, Connecticut, where he worked before and after World War I. During war, he served as a Captain in the Ordnance Department. 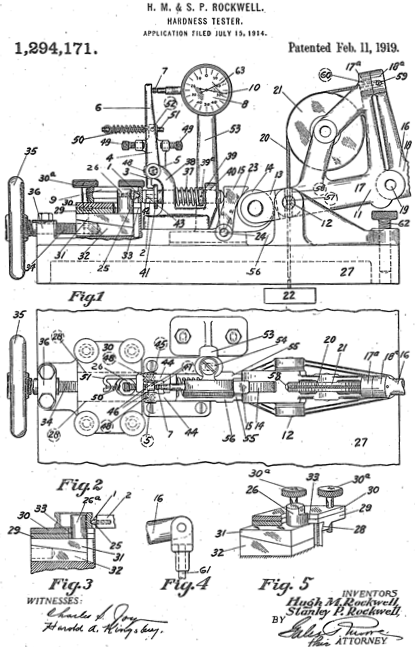 After setting up his own business in Hartford, he added a damping device to the hardness tester to control the approach speed, and in May 1921 filed his third patent. The patent examiner wrote and published a landmark publication in 1922 at the American Society for Steel Treatment (ASST) conference in Indianapolis, Indiana, after which the patent was published on November 18, 1924, with US Patent Number 1,516,208. Stanley left Whitney to form the New England Heat-Treating Service Company (NEHTSC) in Hartford, Connecticut in 1921. It was renamed Stanley P. Rockwell Company two years later and still provides heat treatment services today. In addition to heat treatment and metallurgical analysis, the Rockwell Company also sold stoves for the American Gas Furnace Co. and General Electric and process instruments for Wilson Mills and accessories for the Rodman Chemical Co.
Stanley Rockwell was awarded the fifth Albert Sauveur Achievement Award in September 1939 by the American Society for Metals (ASM) . The Sauveur Award "recognizes groundbreaking materials science and design services that have inspired organized work on similar principles, to such an extent that a significant fundamental advance in materials science and engineering knowledge has been achieved." Rockwell was a seasoned sailor who had spent the summer in Connecticut and the winter in Florida on the yacht with his wife. On a Sunday afternoon in August 1940, Stanley Rockwell suffered a tragic end when his private 50-meter Chin-Chin yacht exploded in the Connecticut River near Middletown when he was alone on board. The boat had been fumigated against insect infestation the day before, but the cause of the explosion was never officially established. Stanley was a son of Willis Rockwell and Anna Mary Rockwell. His brothers were Dudley Pickett Rockwell and Samuel Pickett Rockwell. He was married to Ruth Marguerite Rockwell and had with her the children Dudley Willis Rockwell and Marianna Rockwell. Ante Raic (Arky): Stanley Pickett Rockwell on www.geni.com, 2 September 2018.